Something's Growing in My Shoe! The Dutch are doing well in inventing new sustainable products! 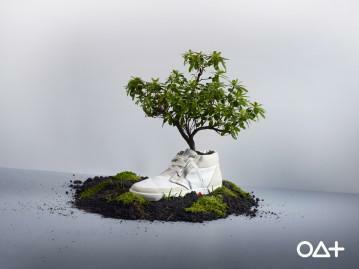 After the Bamboo Boxer shorts I posted a few months ago, the Dutch have now come up with a new brilliant sustainable item: the Oat Shoes. After you have worn the shoes, you bury them in the garden (which I think my kids do already with normal shoes they don't like anymore to force me buying new ones...) and flowers will appear! According to the website the hemp and cotton will degrade within a couple of months in regular potting earth. The plastic has been tested to break down within 6 months in an ideal environment, but this varies with the type of soil, the temperature and humidity they’re buried in. The tongue of the shoes carry a sheet of paper infused with a wildflower mix that will bloom from your shoes when you have buried them! I have to say that I have seen some shoes around our house that I would love to be buried, even without the wildflower mix, just for the smell! That would be a good next step: let the shoes smell of flowers before you bury them!